A new supplement is now on the active market that has been formulated to protect the brain, while enhancing cognitive performance. It's called NeuroActiv6 and it's created by a new supplements company called NaturalCell, which I am a part of. Many of you know my personal MS story and the passion I have for health. Over the years, this passion has led to an ongoing desire to create a nutritional supplement of my own. Well, after two years of analyzing and researching the supplements market, my business partner Tony Almeida and I are happy to announce we have co-founded and officially launched a new supplements venture called NaturalCell and released our very first product to the world. With lots of questionable supplements on the market today, the mission of our company is to always offer people a brand they can truly trust to purchase superior supplements for themselves and their family. In aligning with our mission - NaturalCell takes the quality of our products extremely serious and this is why we've partnered with the leading supplements manufacturing facility in the country, who conducts all operations and processes in accordance with the FDA. Our first product, NeuroActiv-6, is a unique formulation of clinically studied and highly tested trademarked ingredients that have been shown to improve mental brain power, increase focus, and enhance brain energy - all leading to healthy brain aging and increased cognitive health. We have specifically designed our formula to include polyphenol compounds, nootropics, and bio-active ingredients that work together to promote a healthy inflammatory response, lower oxidative stress and cortisol levels, raise BDNF protein, and promote "neural communication" in the brain; enabling neurons to talk to each other more effectively. Best of all, instead of having to consume multiple pills and supplements daily to achieve this same outcome, we've taken the scientifically proven doses and put them into one all-encompassing, healthy and great-tasting drink mix. Increase your mental speed, alertness, and clarity. Make your mind energized and lightening fast. Improves working memory capacity providing clearer and faster thinking. Naturally reduces stress and anxiety and improves general well being by balancing cortisol levels. Contains powerful antioxidants and superfoods that make you look and feel younger, glowing, and radiating youth. Ingredients proven to improve sexual function and enhances libido in both men and women. Delivers the Neuro-Nutrients, Flavonols, and Anthocyanins that keep your brain young, healthy, and feeling that mental zip. Coffee Berry Extract increases levels of a crucial protein called brain-derived neurotrophic factor (BDNF), which is essential for maintaining healthy neurons and creating new ones. Ashwagandha reduces cortisol to significantly improve overall stress, anxiety, irritability, level of fatigue, concentration, memory, and sleeplessnes. Citicoline raises levels of important neurotransmitters, increase brain energy, and protect the brain from damage and aging, as well as increases overall mental performance. Both Grape Seed Extract and Turmeric are effective at reducing stress and inflammation in the brain, boosting memory and potentially preventing some of the damage associated with Alzheimer's disease. Oxidative stress plays a major role in the progression of mild cognitive impairment. NeuroActiv-6 provides the nutritional requirements to help the ageing brain decrease oxidative stress. By restoring this balance in the brain, memory and learning may be improved. Multi-patented, clinically tested Sensoril® Ashwagandha is the ultimate all natural, stress-reducing, cognitive and mood-enhancing dietary supplement with multiple health benefits you can really feel! CurcuWIN® is a unique, highly bioavailable form of Turmeric, proven to be 46X better absorbed than other forms of curcumin - to support cognitive function and antioxidant protection. Citicoline is a potent brain-health nutrient. A proprietary form of citicoline, Cognizin® has been clinically studied to support focus, attention, recall, increases brain energy (ATP) by 14% and speeds up formation of brain membranes by 26% in healthy adults. NeuroFactor® is an all-natural, patented product made from the whole fruit (including the bean) of the coffee plant, Coffea Arabica. Through years of careful clinical research, scientists discovered that ingesting small amounts of whole coffee fruit concentrate significantly increases BDNF levels in humans. Green coffee bean does not work. Chlorogenic acids do not work. Drinking coffee does not work. It is only the whole coffee fruit that goes beyond the bean and delivers support for naturally declining neuroprotein levels in humans. NeuroFactor is also caffeine free. This 100% grape-seed extract is made from seeds that have been removed from the California grape skins before fermentation. Studies indicates that Activin® helps promote a healthy inflammatory response and reduces oxidative stress. A recent Oxford University study found that taking B6, B12, and folic acid together reduced brain atrophy, improved brain function, and dramatically reduced brain shrinkage. Researchers examined 12 studies and concluded that strong adherence to a Mediterranean-style diet was associated with better cognitive function, lower decline in brain activity, and a reduced risk of Alzheimer's disease. Are you or is someone who you love and care for living with Multiple Sclerosis? For people struggling to discover a happier, healthier way to live with this lifelong disease, it sometimes seems like an impossible task. 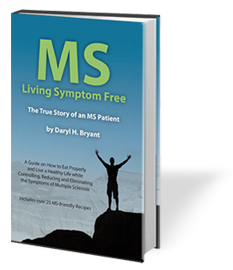 Now, author Daryl H Bryant shares his own challenges, frustrations, anxiety, and ultimate victories in managing MS. His new book shares his stories as a person faced with the disease. Bryant is not a doctor, but a person living with Multiple Sclerosis.